A van driver has been killed in a pile-up near Calais after a group of migrants blocked a road with tree trunks as they tried to board vehicles travelling to Britain. The driver died when his vehicle crashed into one of three lorries halted by the roadblock and burst into flames. Nine Eritreans were found in one of the lorries held up by the roadblock and were arrested, according to French authorities. Such roadblocks have caused accidents in the past but this is the first time they have been linked to a death, an official told the Associated Press. A spokesman for the Prefecture du Pas-de-Calais said the crash took place in the early hours of Tuesday morning between junction 49 and 50 on the A16, near the town of Guemps. The van was registered in Poland but the identity of the driver is currently unknown. Calais has seen large numbers of migrants returning to the area in recent months, less than a year after the French government shut down the 'Jungle' migrant camp. Make-shift roadblocks are often used by people attempting to sneak onto vehicles bound for the UK. The UK-based Road Haulage Association has called on President Emmanuel Macron to do more to ensure the safety of drivers. Chief executive Richard Burnett said: "The security forces currently in place just cannot cope. It's not just Calais itself that need protecting; it's the approach roads too. "President Macron must get a grip of this situation and we urge him to deploy the French military to provide safe passage for the thousands of UK-bound hauliers that use this route every day." The calls for the French government to do more were echoed by Britain's Freight Transport Association. 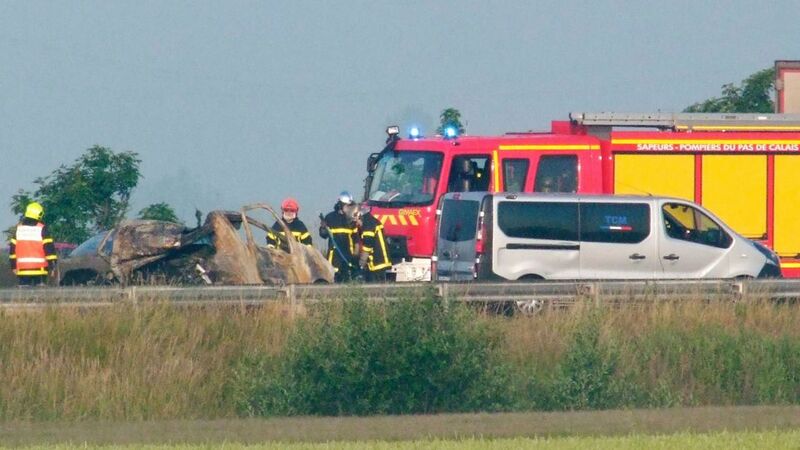 The organisation's EU affairs manager, Chris Yarsley, said: "This tragic incident demonstrates the risks to drivers and other road users, including day trippers and tourists. "This death was wholly preventable and we must ensure that no-one else dies as a result of the dangerous actions of migrants on the roads."